Today I'm gonna go over some head-scratching (some of which is still bugging me) I did on the weekend. I kinda got stuck with how I should be testing something, and this raised questions as to whether I even should be testing something. It's a reasonable exercise to go through, so I will document it here. First: recap. It's worth mentioning again that whilst it's taken me three blog articles to get to this point, so it might seem like a mountain of work, in "real time" all this stuff took about 10min maybe. Basically I sat down to decide how the function will need to work - just at a mechanical level so far - and wrote a test for each step of that, and then back-filled the logic to make the tests pass. And with more complex objects such as a struct, I'd test the structure of it, similar to how I test for the on and trigger keys in the test above. And if the struct was complex, I test all that complexity (and wish I was returning an object, not a struct!). But I would not test the contents of the keys, as that's generally data. I also try to avoid "testing CFML". If I have a function which - in its definition - says an argument is a struct, I do not bother to test that it won't accept a string instead. This is not testing my own logic, this is testing whether CFML works. And I'd like to think the Adobe / Railo guys have already done that for me. And if they haven't, it's not my job to do anyhow. However in this case, I kinda feel like I should be testing the "integrity" of what I'm returning from the function: making sure the returned on() and trigger() functions return functions of the correct signature. This would be dead easy if CFML supported delegates, but it doesn't so that's no help. "Callbacks, function expressions, anonymous functions, delegates (OK, and closures I s'pose)"
"What do I want to see in ColdFusion 11?" "The returned trigger() function needs to be a delegate of type TriggerDelegate"
Reminder: a delegate is a "type" of function. Kinda like to a function what an interface is to a CFC. So - rightly or wrongly - I've decided to check the method signature of the returned functions too. Before I can do this, I need to work out what the method signatures should be. on() will bind an event handler to an event, so it'll need at least those two arguments: event and handler. It might also need some data (as inspired by JQuery, to an extent: on()), at some point, but that's "at some point" so out of scope just now. 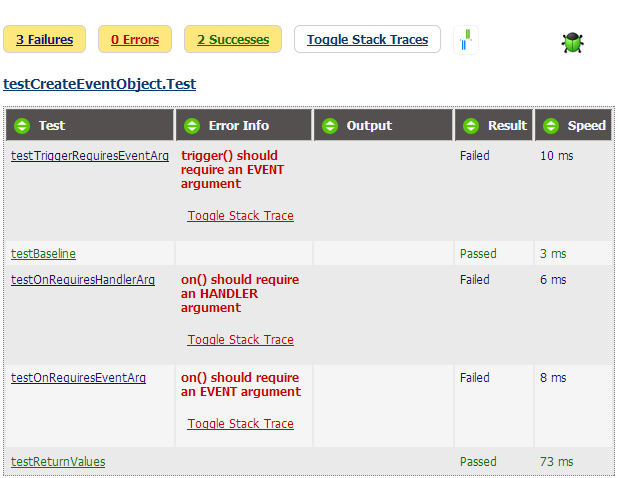 This is TDD which is iterative, and I should not be implementing anything "just in case". trigger() will fire an event. so all it needs to do is to take which event to fire. Similar to above it might need to pass some additional parameters at some point (as per JQuery's trigger()), but we'll deal with that later. Note that I've refactored slightly here, I've added a setup() method which creates variables.eventObject, as I need it in every test. Remember that setup() gets called before every individual test function. Basically in these tests I simply call the returned methods passing in values for all arguments except the one I'm testing the requiredness of. So when I'm testing that on() requires an event argument, I don't pass that in, but I do pass in anything else that I need to make the function work. This is so I got get other problems with the test, and I am only testing the one thing I intend to. But that's the best I could quickly come up with that will work on both ColdFusion and Railo. Being realistic, it's unlikely any exception which matches that test will occur other than the one we're looking for. I was going to continue onto my next dilemma, but I'm short on time today, so in the spirit of quick iterations, I'll get this out the door and discuss this next quandary (as yet not quite resolved), tomorrow.